Nipsey Hussle wears Puma gear while hosting a party at Gold Room in Atlanta on April 7, 2018. On Christmas Day 2017, Nipsey Hussle pulled up to Staples Center in style. For a game between his beloved hometown Los Angeles Lakers and the Minnesota Timberwolves, the 6-foot-3-inch Hussle broke out a throwback Magic Johnson jersey that he paired with some fresh Puma Suedes in a Lakers purple colorway, with gold stripes and white laces. As he watched the game from courtside with partner Lauren London, cameras snapped photos of his kicks. Yet Hussle wasn’t just showing off a new pair of shoes. He was actually teasing a major move that he and Puma had been working on for the new year. In mid-January 2018, the West Coast MC arrived at L.A.’s Power 106 for an appearance on The Cruz Show. And with him, he brought a stack of paper and a pen. Before the interview began, Hussle had something huge to share. The deal represented a strategy and willingness on the part of Puma to put on for the culture by embracing the most respected figures in music and entertainment. Hussle joined fellow brand ambassadors such as Rihanna, The Weeknd, Big Sean, Meek Mill and Jay-Z (who became the creative director of Puma basketball in June 2018). But truly, nobody repped Puma quite like Hussle. It was apparent how much pride he took in being a part of the iconic brand that had become a staple of lifestyle footwear and apparel. 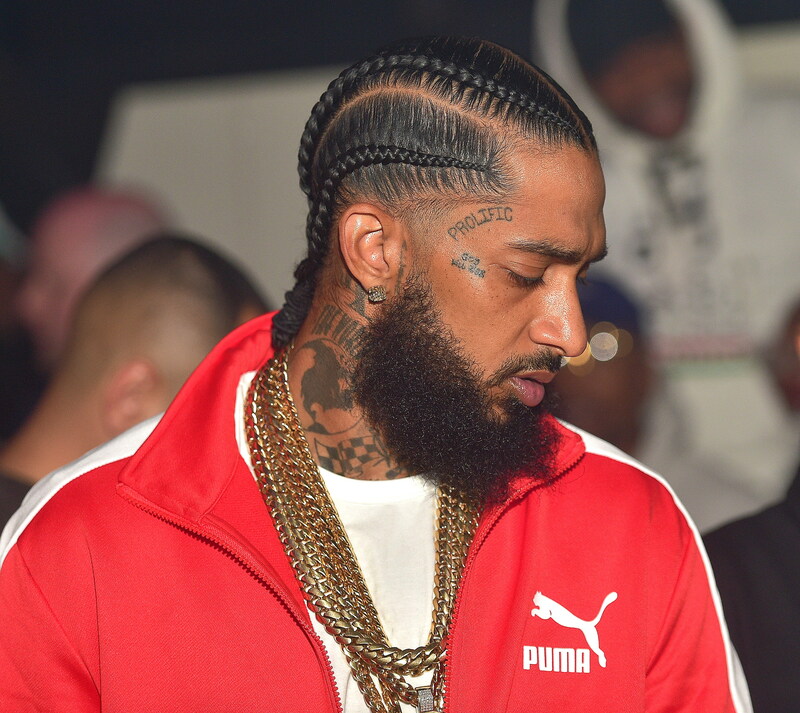 Puma sweatsuits and sneakers became as essential to Hussle’s everyday swag as his straight-back braids, picked-out beard and body mural of tattoos. Puma sweatsuits and sneakers became as essential to Hussle’s everyday swag as his straight-back braids, picked-out beard and body mural of tattoos. He rocked Puma during shows, on private jets and, of course, in photo shoots for the brand’s ads. But most importantly to Hussle, the partnership led to collaboration within the community he so tirelessly sought to positively impact. With his Puma partners, Hussle designed and sold special-edition Puma products, from T-shirts and hoodies to pairs of Clydes, at his The Marathon Clothing store on Slauson Avenue in the Crenshaw area of Los Angeles. It was outside of this store that Hussle was shot and killed on March 31 at the age of 33. According to a report from TMZ, he went to the store on a whim, and without security, to get clothes for a friend who had just been released from prison after 20 years. Hussle wanted his homie to look fresh when he saw his family later that day. As the community of L.A. and the worlds of music and sports mourned the death of the man born Ermias Asghedom and known as Nipsey Hussle tha Great, so did Puma. Hussle noted that the shoe wouldn’t be personally branded. Instead, it would represent his store, and by extension his city and its people. In October 2018, Hussle collaborated with Puma to refurbish and vividly repaint the basketball courts at 59th Street Elementary School, as well as donate $10,000 on behalf of the brand and The Marathon Clothing store, where Puma Clydes with “TMC” featured on the tongues first went on sale last summer. When DeMarcus Cousins returned to the court in January, nearly a year after rupturing his Achilles tendon, the four-time NBA All-Star played his first game back with the Golden State Warriors wearing a Nipsey Hussle-inspired player exclusive that included the phrase “The Marathon Continues” on the midsoles. The following day, Puma threw a party for Hussle to celebrate his 2019 Grammy nomination. The brand even commissioned sneaker customizer Mache to create 36 pairs of special Puma RS-X Trophies that Hussle could give to the people who helped the album come to life. The event was hosted almost a year to the day that Hussle signed with the brand. That fruitful first year of partnership paved the way for even stronger commitment from Puma to the rapper turned brand ambassador, which he revealed (again on Power 106) in what is now one of his final recorded interviews, this time on the L.A. Leakers program. Hussle announced a new deal for 2019 that would yield multiple co-branded collections with The Marathon Clothing, the first of which was scheduled to drop this fall and include apparel, accessories and a sneaker. But Hussle also noted that the shoe wouldn’t be personally branded. Instead, it would represent his store, and by extension his city and its people. Hopefully, this marathon of a partnership continues. We need that collection, and that sneaker, in memory of the late, great Nipsey Hussle — one of the realest, ever.